This was the statement of Pampanga Chamber of Commerce and Industry, Inc. (PamCham) vice chairman Rene Romero during the culminating ceremony of the 27th North Luzon Area Business Conference (NLABC) held Friday, May 18, at the LausGroup Event Center in the City of San Fernando. He noted that the three-day event proved to be “one of the most successful” area business conference of the Philippine Chamber of Commerce and Industry (PCCI), as it gathered over 600 delegates coming from all over North Luzon. “We are really very happy with the outcome of our event, as modesty aside, while it is our first time hosting this conference, we have come up with the biggest and most organized NLABC I have seen for the last 30 years that I have been part of the chamber movement,” he relayed. He added that the positive feedback of the participants proved that event was able to showcase the latest developments in Pampanga which include state-of-the-art facilities, infrastructure, and the province’s renowned hospitality sector, further centering the province’s status as a major economic destination. “In fact, delegates coming Ilocos Region, Cagayan Valley and Cordillera Administrative Region (CAR), all expressed their awe upon seeing our province’s progress. They said they were impressed of Pampanga’s recent developments including the LausGroup Event Center, our main roads like the Jose Abad Santos Avenue and the McArthur Highway, business districts, the Clark Freeport Zone, and even the hotels and malls including the newly-opened SM City Telabastagan,” he shared. “This goes to show that we are now experiencing the spill over of Metro Manila and big players are now eyeing us as their next prospect. The NLABC is one of our way of preparing for this forthcoming economic boom,” he added. The executive then relayed that the business organization will continue to hold on to the claim that “This is our time,” this year’s theme for the 27th NLABC. “This is just the start, and for a very long time and through the generations to come, we will not stop or plateau. It will be a continuous process,” he concluded. 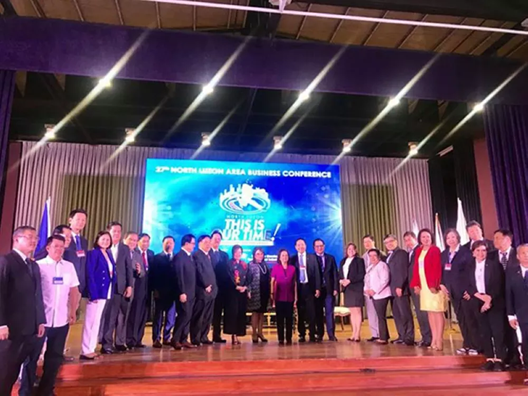 The prestigious business conference, organized annually by PCCI, aimed to inform, inspire, and motivate businesses to spur countryside economic growth in Central and North Luzon regions. This year, highlights of the event include plenary sessions led by world-renowned businessman and AirAsia Group CEO Tony Fernandes, top Filipino economist Dr. Bernie M. Villegas, and Department of Public Works and Highways Undersecretary for Planning and Public-Private Partnership (PPP) Dr. Maria Catalina E. Cabral, among others. The event was keynoted by former President and Second District Representative Gloria Macapagal-Arroyo who shared the government’s plans and activities currently in the pipeline for the years ahead, demonstrating a strong focus on transforming the province as a ‘Megalopolis’. Also part of the programs and activities were various seminars, business matchings, networking sessions, invitational golf tournament, and a mini regional trade fair.